Our Kickstarter campaign for Cons Against Our Sanity is over! 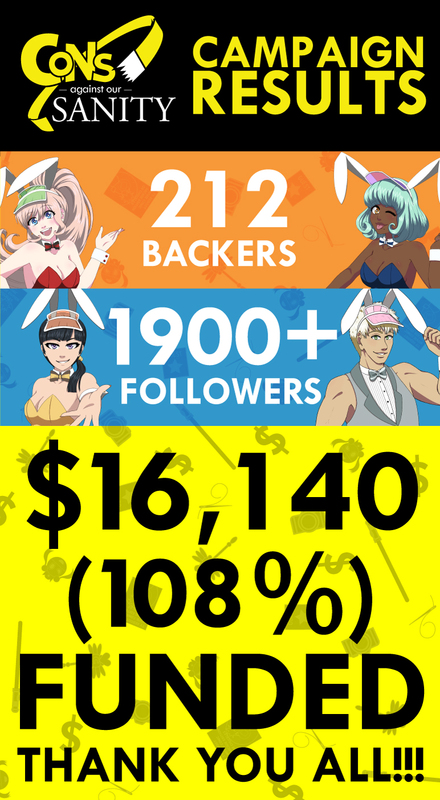 Thanks to the donations of 212 backers, as well as the support of over 1900 people across our social media pages, we raised $16,140 - 108% of our original goal of $15,000! As a result, the game will be printed and sold across various conventions that we visit! And our first stop will be Tampa, Florida for MetroCon 2017, running August 3rd-6th! Come visit our booth at the Vendor's Entrance to get one of the first copies of the game! We at Kronotiq Media are forever grateful for the support we have received throughout our first big campaign. There's much more to come for the Cons Against Our Sanity project, so be sure to like our official Facebook and Instagram pages, or visit the Kickstarter page!